Working on my latest React Native project, I decided to make the jump from React’s state to Redux. I looked through all the examples I could find, the majority were from 2015, and couldn’t find something simple and minimal. Also, a lot of things have changed since 2015, and even 2016 — giving me a good excuse to start from scratch. My first step was to go through the Redux docs and tutorials to give myself a clean slate, instead of just copying code from my previous projects. The above link has a minimal example of a Redux implementation, and is what I used as base for my project. 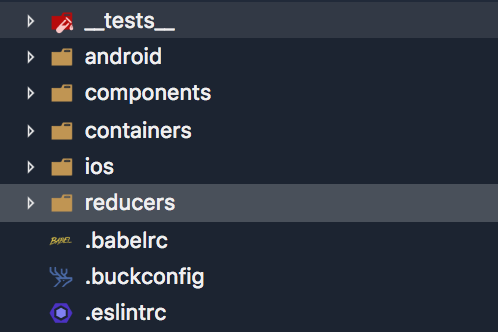 This is the directory structure of the app which contains Components, Containers, and Reducers, pretty common with a standard React/Redux app. Simple React Native Redux Example app running in iPhone Simulator. To show the list of items, I’m using the React Native ListView that is using a Redux Store(items) as its dataSource. There are two actions in the Reducer; ADD_ITEM and REMOVE_ITEM. The ListView requires a dataSource, and must be re-rendered when the dataSource is updated. To do this, the dataSource gets mapped to a prop using mapStateToPros, and then we connect the Component to it. View the entire code at https://github.com/aaronvb/react-native-redux-example.